I'm Madeline, and I'm 11 years old. My favorite flavor of ice cream is vanilla. I just finished Flipped. I chose it because I liked how you could flip in between two people's lives. My favorite part was when Bryce planted the syma...symca...symacorn...symacore...that tree in Juli's back yard. Whatever. I can't say it. Anyway my favorite part's when Juli got all the chickens. I wish you didn't ask me this. Seriously. Anyway, I'd confront him. Just tell him the truth. I would say: "You should read this book because you get to read with two main characters and that's really cool." I love the cover. I like how the chicken's upside down. Um, probably. Yeah. Because it's a good book and it's not very big so I can read it very quickly and win our class reading contest. *thinks for an entire hour* I don't think there's another book that reminds me of this one. I would ask: "Why did you decide to write this book?" 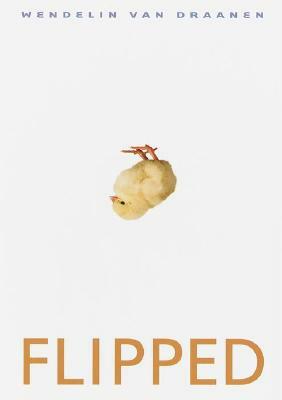 I was able to find an interview with Teen Ink where Wendelin Van Draanen discusses her inspiration for Flipped. In the interview, she states: "I saw my students doing the same thing I’d done at their age—crush on someone because they were to-die-for cute. And, being a teacher, no student is going to take your input when you say, Oh, honey—he is so not worth it. So I came up with the idea of telling both sides of the same story in voices they would listen to to illustrate different perspectives on not just love, but life." Thanks, Madeline, for sharing your thoughts with us!